Video courtesy of the Long Beach Police Department. After noticing a smartphone app launched by Santa Cruz Police–the first police department in the nation to release one–the Long Beach Police Department reached out to Sunnyvale-based company MobilePD to develop something for Long Beach citizens. Jamieson Johnson, co-founder of MobilePD, said there were multiple goals the LBPD wanted to reach with the app, which launched June 20 after several months of development and branding. In terms of functionality, the Go LBPD app is similar to others developed by MobilePD. It includes the ability to provide anonymous tips, view interactive crime maps, get instant access to LBPD news, watch LBPD YouTube videos directly from the app, browse LBPD photos and view alerts sent out by the department. Johnson said that MobilePD also will be releasing an update that will add even more features. “We are doing everything possible to simplify the modern methods we use to communicate with the public. An informed community is a motivated community, and streamlining this process ultimately strengthens our capabilities and increases our effectiveness through community involvement and awareness,” said Long Beach Police Chief Jim McDonnell. Go LBPD joins the City’s growing family of “Go” apps, including Go Long Beach, where you can report graffiti and potholes for service, and Go Long Beach Public Library, an app that lets you do everything from search the library catalog to check your local library’s event calendar. 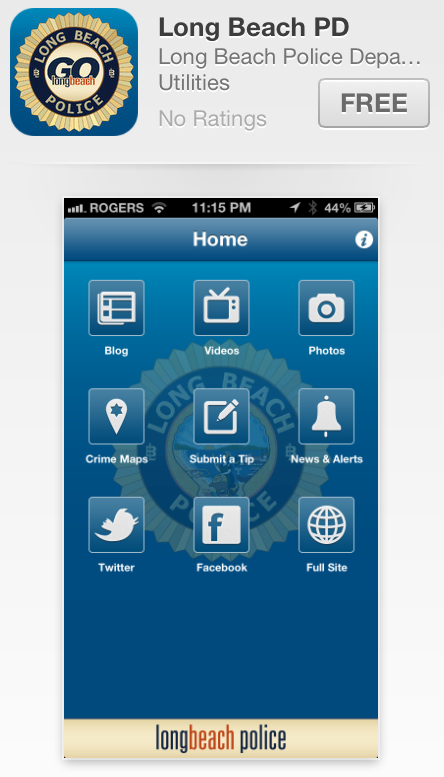 Go LBPD is available for free in the iOS App Store and the Google Play Store.